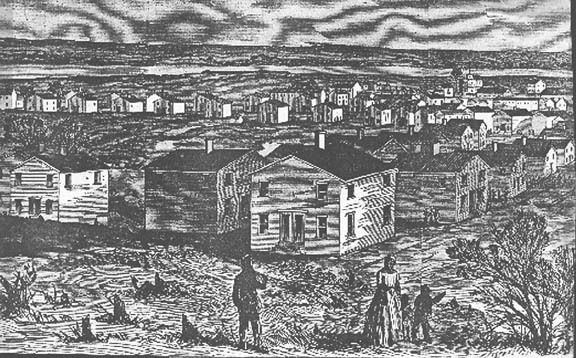 Freedman’s Village as it appeared in Harper’s Weekly in May 1864. You’re recycling yourself. I read much of this a few weeks ago, shortly after the county board realized that the Vihstadt vote was a referendum on the streetcar and that forcing the issue would be political suicide for the Democratic party in Arlington. As a fellow resident of south Arlington, and a lifelong resident of Arlington, I’ll point out to your readers a few facts or interpretations that you left out. Spending by the county on south Arlington in recent years has included the sparkling new Long Bridge park, the brand new community center on Columbia Pike near Four Mile Run, the bike trail improvements, the Barcroft Park improvements including that excellent gym on Four Mile Run Drive, and of course, the famous “million-dollar bus stop” on Columbia Pike. You mentioned the sewage treatment plant, built years and years ago. Why is it there, instead of in north Arlington? Because water flows downhill, and that site close to where Four Mile Run flows into the river is probably the lowest point in the county. Why is Wakefield the third of the three high schools to be rebuilt? A good question, but I don’t think your south-Arlington-gets-the-fuzzy-end-of-the-lollipop reasoning is very strong. W-L was a horrible, horrible building in nearly urgent need of replacement. Yorktown, over in the richest part of town, was a cobbled-together mess built onto an earlier grade school that was built in the late 1940s or early ’50s. Wakefield, far down in south Arlington, was the new, state-of-the-art high school, and while possibly in need of replacement was in nowhere the same shabby state as the other two buildings. I was surprised, in fact, that they decided to replace it, but it will certainly be a state-of-the-art facility, probably even more modern than W-L or Yorktown when it’s finished. And, by the way, have you noticed that W-L, despite being brand-new, now has kids going to class in trailers, over there on Quincy Street? As far as the benefits of the Metro Orange Line/Interstate 66 construction are concerned, you neglected to mention the more-than-200 houses that were condemned and torn down to make room for the project. And you really should point out to your readers who don’t live here that the Silver Line to Dulles airport is a spur off the Orange Line; you write as if there were a choice in where to build it, but Metro is where it is, and the airport is where it is — how would a more racially diverse approach change that? You also failed to tell your readers that the Metro Blue Line does, in fact, pass through south Arlington — in fact, much of it is within a couple blocks of Rt 1, the infamous Jefferson Davis Highway that was not so-named by anyone in Arlington, another fact you failed to tell your readers. In my 60-some years as an Arlington resident, I have lived in central Arlington, north Arlington and in south Arlington. Now living in south Arlington, just a few blocks from where you live, I enjoy the slightly greater level of racial, ethnic and economic diversity, but in no way to I feel that we’re getting less than “they” get, and I can tell you that I certainly don’t miss the thunder of the jets taking off from National airport, an amenity that the folks in the million-dollar houses over by Lorcom Lane enjoy every two minutes, starting at 6 am. As to the streetcar, like many of my neighbors, I was at best an equivocal supporter, realizing as they did that there isn’t room on that four-lane road for a streetcar and also realizing that I would almost never have used it even though it would have run four blocks from my house. The buses and auto traffic on Columbia Pike are a big pain, and while the road is unlovely, it’s not a whole lot unlovelier than Wilson Blvd. or lee Highway, especially since they replaced the 7-11 at Lee Highway and George Mason Drive with a Title Max. Concluding, I think you raise some interesting points, but push them farther than the facts will go. Not many of your readers outside of Arlington will know that, however, so you’re good. I should have made it clear that Wakefield was the new state-of-the-art high school WHEN IT WAS BUILT, which was in the 1950s. It’s been eclipsed, and so being replaced, but the original Wakefield building was a lot newer than the much older original Washington-Lee building. Hey, I just noticed that your headline promised another raw deal for Freedman’s Village, but you never explained that. I think that there were some in the county who wanted a museum or something to memorialize the site, which probably was where the Navy Annex was before they tore it down this year. The county worked out some kind of land swap with the Feds so they can expand Arlington Cemetery to make room for more bodies from our perpetual wars, and as part of that deal I think they’re supposed to build something to recognize Freedman’s Village. Not sure where that stands now. Because water flows downhill, and that site close to where Four Mile Run flows into the river is probably the lowest point in the county. I suppose you meant to say that in general, the southern part of Arlington County is lower than the northern part. That’s because everywhere along the river is darned near the same elevation. Still, it would have been nice if you’d offered a link to a Topo map. An outsider like myself can make very little sense out of your local situation without many links, and neither you nor Mr. Parry were providing any. This doesn’t explain why the good citizens of the area don’t RENAME the highway. That’s a spit in the face of everybody who doesn’t embrace treason. Be assured I’d not be happy driving on a “Robert E. Lee” Freeway or a “Benedict Arnold” Road – those were two more world-class American traitors. I don’t know how to provide links, sorry. But yes, the highest elevations in Arlington are in the north and west areas, and the whole county basically slopes to the southeast, into the Potomac River. But of course, the river is not all at the same level — it would be a lake if that were so. Four Mile Run drains much of Arlington, although there are some smaller streams flowing directly into the Potomac from the highest points. I really don’t know if the “good people” of Arlington have it in their power to rename a federal highway; it’s always stuck in my craw that Rt. 1 is named for Jefferson Davis — that name carries on down through much of the south, except interestingly, in Alexandria and down toward Richmond it’s designated Richmond Highway. As for naming highways for other rebels, Lee Highway runs through north Arlington and throughout all of Northern Virginia there are tons of things named for various confederates and slaveowners such as George Washington or Thomas Jefferson. Again, interestingly, when Stonewall Jackson grade school was remade into a “traditional” school in the ’70s, Jackson’s name was quietly dropped. The “Lee Mansion,” whose formal name is Arlington House, was in fact the property of the woman whom Lee married; Custis was her family name, and I’m not sure Robert E. Lee ever lived there. The slaves were not his “property”, they were hers, and if I remember this correctly, I don’t think Lee had any slaves. But George Washington, father of our country did, and another fact that’s not widely recognized, at the time of the revolution there were slaves in ALL of the colonies/states — All OF THE– and slavery was continued for several decades before dying out in most of the north. 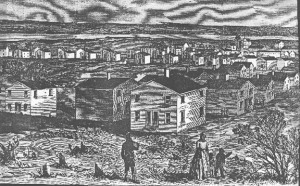 Many of the great fortunes on which the liberal capitalist economy of the northeastern states was built were derived from the slave trade. I say that lest anyone become too enthusiastic about casting stones. … I donâ€™t think Lee had any slaves. And that he was a nastier slave-owner than most. Despite having been an active slave holder for 56 years, George Washington struggled with the institution of slavery and spoke frequently of his desire to end the practice. At the end of this life Washington made the bold step to free his slaves in his 1799 will – the only slave-holding Founding Father to do so. On a scale of one to ten, Washington is at least a “9”, but Robert E. Lee is a “0” because he was determined to destroy the US to preserve a horrible institution. That he was a middling good (in the tactical sense) general doesn’t weigh in on the morality scale. As far as the ‘original sin’ argument goes, the Brits were worse than the Americans at the start of slaving. But they sort of ‘got religion’ and began opposing the practice. The grandchildren of British slavers were NOT responsible for what grandpa did. In terms of morality, I don’t feel any special shame because one of my Revolutionary war ancestors was a slave owner. That was many generations ago, and his sins don’t transfer to me. Still, it’s a point of pride that gentleman was the ONLY slave owner. Another is that not a single ancestor of mine fought for the South. A crazy southern cousin has been trying to locate some delusional patriots and/or traitors in his family tree. No luck so far, thank goodness. Mr. Parry, I suggest you read Claude Bowers” book “The Tragic Era”, and what you can of his references and bibliography. Actually read the pages and material. If you do you will recognize a lot of parallels to today, with some remarkable (as in worth remarking, not “amazingÂ¨ ) contrasts. Among the parallels are the manners and styles and actions of the politicians and political leaders. Also the behaviors of the powerful and empowered against the unempowered. Also the importance of suborning the press to the maintenance of the injustice, pillage and robbery. Among the contrasts you should notice the “plight” of the defeated, and how the cases illustrating parallel situations today, including unequal justice and permitted, condoned and abetted thuggery oppression, abuse and murder. You should notice that the victims in the “Tragic Era” were white people, and you should take notice that the abuses parallel uncomfortably closely the abuses today being practiced against black people. You should come away with a better understanding of the issues that are being flapped around today as “racist” issues. The issues are not in fact race issues, even though they appear and even masquerade as race issues. The issues are abuse and corruption issues. They are chameleon and take whatever forms the corrupt and abusive are able to color them with. They are the underlying issues, and they boomerang: Jim Crow came out of the so-called “reconstruction”, and reactionary response will come out of the present corruption. About the best that can be done will be to try to focus the reaction to prevent as much peripheral damage and point it to the corrupt and abusive. Knee-jerk racism, for whatever race, or against whatever race, is red-herring and draws attention away from the real core issues, which are directed against anyone of any race, religion or “other” classification that the abusers can use to justify their abusings. But a vocal contingent of Arlingtonians questioned the promised benefits of the project â€” whose price tag eventually reached $550 million â€” and wondered whether it was an example of county-funded excess. It was impossible for me to make any sense out of the situation, for the quoted numbers were all over the place. And they seemed to go up constantly – for no visible reason. I found a piece saying that bus stops were to cost 1 million dollars apiece! Tinfoil hat time: the local Powers That Be never had any intention of actually building anything for anybody but White Folks. But it was advantageous to pretend they would. Allow time to pass, and to opposition to peak by gold plating the parts of the project which weren’t already made of solid silver. Following this line of reasoning, I’d predict the replacement bus service will be as nearly worthless as it’s possible to make it. Supposing it actually happens at all.